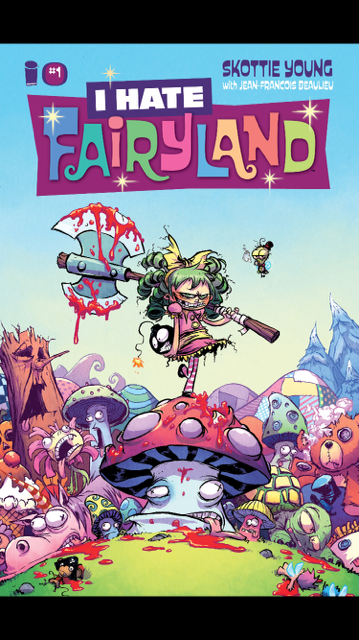 Does I Hate Fairyland make the cut? Ever felt like you need a break from the male superhero archetype that saves the world from utter desolation? Well I do. From time to time I make an effort to venture outside of my comfort zone and pick up a book, comic, or movie that differs from the hype. I Hate Fairyland is that book! I have always enjoyed Image comics and this book definately makes the cut. Skootie Young writes and illustrates a great story where the concept of a fairytale land is toyed and expiremented with in such a creative and fun way. Gertrude wishes to be taken away, as many young boys and girls do, to a far away land where its all fun, simles, and games. Gertrude got her wish and is whisked away to a far off land (Fairyland) where she meets Queen Clouda and Larrigon, her quest companion, among other interesting and out-of-the-box characters. She quickly decides she wants no part of this dream land and wants to go home. To do so, she must find the key back to her home land. Her journey proves to be filled with surprises, action, humor, and even blood and gore. Young’s art is detailed and rich with amazing expressions and beautiful scenery that promises to be worth the page turn. Young plays with every place that Gertrude and Larrigon visits. This first book gives the reader a glimpse into a series that promises to push the limit with any concept of a fairyland world or story the reader knows. I Hate Fairyland is quickly becoming a favorite of mine. ← Is Ridley Scott’s The Martian a sci-fi classic or a sci-fi dud?